Attention! : “his master’s voice” invade us! Who says there’re no leaders? “The Bishop of Cordoba has warned of a plan to increase the gay population”, is the title of an article published in “El País” on January 3, 2011. “UNESCO has a plan to make half of the world’s population homosexual”: this surprising statement, according to the article, was made by the Bishop of Cordova, Demetrio Fernández during a homily delivered during the Festival of the Holy Family on December 26. And instead of correcting this nonsense –actually uttered by the Bishop of Cordoba and possibly by the Cardinal- the Bishops Communications Service for Southern Spain posted it on their website! Not only Catholics, but all citizens should protest declarations of this type, which can be extremely damaging to people of good faith. I personally want to present my strongest protest for the silence (and they have kept silent on so many questions that shouldn’t have been silenced) of the ecclesiastical hierarchy, the Spanish Bishops Conference and the Papal Nuncio in Spain, demanding that they immediately offer the apologies that are due. It is intolerable that the Spanish Catholic hierarchy addresses topics that not only conflict with the good sense required in a democracy where there is no official religion, but which also outrage many of us believers. We are likewise outraged by these costly mass demonstrations in which the Gospel is conspicuously absent. And abandoning the national framework, which perhaps due to inertia has for many years tolerated acts and expressions characterized more by their arbitrariness and partisan nature than by religiosity, they are now invading the international scene with this implausible slander of the intellectual organization of the United Nations system, UNESCO, whose mission is precisely to build peace –certainly a Christian and Catholic objective- through education, science and culture, and whose Constitution proclaims equal dignity and the “democratic principles” that mankind must follow to achieve it. When so seriously and so flippantly offending this Institution, they are also offending all teachers who in a world of all colors, sensibilities and identities give their lives to educating “free and responsible people”. “Free and responsible”, in the words of the Article I of the UNESCO Constitution. You, Mr. Bishop, Mr. Cardinal, with your criteria and falsehoods would educate people to be irresponsible, subjugated and confused. Free, responsible and equal in dignity, without discrimination of any kind based on gender, ethnic origin, ideology, beliefs, cultural identity, sensibilities... This is the education that will enable each unique human being, endowed with the capacity for creation, to “conscientiously manage his own life”, as the incomparable definition of Francisco Giner de los Ríos described it. People who don’t act upon the dictates of others, who are not indoctrinated nor do they live in fear, since as the renowned first paragraph of the Preamble to the Universal Declaration proclaims, the exercise of human rights "frees humanity from fear". Is this why certain members of the ecclesiastical hierarchy oppose education for citizenship? It’s time to rectify this error. This would serve to correct not only the present absurdity, but might also prompt them in the future to think twice before saying such outrageous things, and there have already been so many. The academic, scientific, cultural, in summary, the intellectual community will not remain passive and silent much longer. Media power is turning out to be one of the most dangerous tentacles of the “great powers”: speculation, biased and distorted “ratings”, both in economy and education, uniformity… and, what is worse, disseminating information that doesn’t reflect reality, but rather the ideology of the “master”. And, more and more, the same “masters” control the majority of the media. Television, the press… generally offer dangerously biased and partisan information to citizens who, also generally, are disoriented because they accept the news they receive in good faith. As for television, in Spain we have recently witnessed the “merger” of channel "Cuatro"… and now, CNN+! With the exception of public television, the objectivity of Spanish television is going the way of Italy or the U.S.… . The same may be said of the press. Even traditionally “independent” newspapers are now “global”. Let’s take action to support the autonomy of the communications media. This is essential for genuine democracy. Citizen power cannot continue to be passive and indifferent. It is scandalous to witness the media’s loyalty to their “sponsors”, normally with a view to elections. Exceptions are progressively becoming scarce. I must reiterate that those citizens who read newspapers or watch TV channels that are absolutely void of objectivity and “out of focus”… become permanently attuned to lies. We need and we have the right to truthful information. George Orwell once said, “During times of universal deceit, telling the truth becomes a revolutionary act”. For a better future, keeping in mind the coming generations and the voice that we owe them, we must commence a “peaceful revolution” to tell the truth, to have access to information that accurately reflects events as they occur and that enables us to analyze and compare. In that regard, I am reminded of a French proverb that says that analysis may be devastating, while comparison is consoling. Will we continue as passive spectators? For how long? In his excellent speech last October 28th, the likewise excellent journalist Ignacio Ramonet said “Great regional and even worldwide communications conglomerates want to convert journalism into domesticated entertainment, in a detestable simplification of reality. Anything significant is diluted in trivia and sensationalism replaces analysis. Journalists must reaffirm their fierce will to know and comprehend, to enable them to transmit”. This is the journalism that we demand today. And either we get it, or we will cease to purchase the newspapers and the products advertised on “dependent” television channels. The power of citizens will soon be made known. Reading Johan Galtung’s article on Wikileaks –called “Weeklyleaks”- published by Roberto Savio in “Other news”, I was filled with hope while being confirmed in my conviction that we must all, to the extent possible, contribute to achieving the urgent changes that are capable of illuminating the horizons of mankind, which are today so dismal. Let us reflect –“bit by bit”, as Piyayo described it- upon his analyses and proposals, which are so lucid, so comforting, and let us decide to unite our efforts, especially in cyberspace, to tear down the media walls and surmount any obstacles that oppose the radical changes that we must make without delay, to the benefit of our future generations. We’re not willing to allow them to ignore leaders such as Johan Galtung, -to continue the great energy, media, military and economic powers are in so few hands- to force all mankind to follow the same path in the same system that provoked the serious democratic, ethical, social and environmental crises that we all now face. There are about 2.000 nations in the world, and only 200 states, meaning that most states include many nations. After reviewing state and nationalist alternatives, he describes a “sustainable system” which should protect a livable natural environment and satisfy the four basic human needs: survival, welfare, identity and freedom. Since violence is the consequence of unresolved conflicts, the key to survival is conflict resolution. The necessary resources are available to guarantee people’s welfare, meeting the essential material needs of food, housing, healthcare and education. The only problem is that their distribution is extremely unequal. “A global identity”, he writes, “would require unity in diversity, welcoming a rich variety of cultural expressions while recognizing that their common goal is human happiness”. And he adds that governance in which national interests prevail at any price would not provide a solution nor promote this world federation. “The diplomats of the Wikileaks documents belong to an era of the state system that we have to put behind us”. They must not continue to hide their incompetence behind veils of secrecy. Democracy means transparency, not “feudal games”. And he concludes, “Wikileaks, thanks. May you become Weeklyleaks. We need you”. There is no doubt about what we must do: return to the democratic principles that the globalizers replaced with those of the market; unite together, all different but bound by shared universal values, and “re-found” the United Nations to be able to build this world federation, this coordination that would put us on course and provide momentum, which today is the dream of so many who are aware that our present course is leading us to disaster. People like Johan Galtung are showing us the right path for the future. Let’s follow him. Yesterday was the first anniversary of the tragedy. As an urgent call to action, I want to invoke my memory of all of the victims, of all of those who with their death (over 200,000 people) should inspire our lives. For all of those who continue to suffer neglect, lack of affection, humiliation –injured physically, we spiritually- my attentive gaze, my outstretched hands, my remorseful heart. I ask their forgiveness for not having worked for them as they deserved, for not having echoed their cries; for not having denounced with the intensity and regularity that their suffering merits the immense injustice to which they have been subjected. On March 30, 2010 the international community pledged to provide 5,300 million dollars (a little more than what’s invested daily in military spending and weapons). Only about 40% of that amount has been received. What a shame! What a disgrace that we continue spending to arm ourselves to the teeth… without rapidly and efficiently remedying such horrendous situations! What a disgrace that petroleum prices continue to rise, tax havens continue to operate, drug trafficking and speculation are rampant…! It is deplorable and inadmissible that the wealthiest countries continue to seek to rule the world (presently, the G-20), ignoring the United Nations, which is the only institution that, duly reinforced, could oblige countries to keep their promises, relieve so many who despair, and mitigate suffering such as the agony endured by the Haitians this year. All have been beset by speculators, by a market that has given or consolidated power in the same few hands, wrenching it from those who sought social justice and equality. There are too many who remain silent, distracted by television and computer screens, mobile phones, video games… without the time to reflect and act freely, based on their own deliberations. Today, the first anniversary of the Haiti earthquake, and also remembering Pakistan and all of those who die each day from hunger and neglect, many, millions of us should cease to remain silent and raise our voices in favor of Haiti. A year later, shame and sorrow. And raised voices. I wish for a cyberspace earthquake to demand social justice from the world’s most powerful. I hope that millions will “click” in favor of human dignity. If we reflect for a moment on how much we have and what our children and grandchildren have, we will feel the pangs of urgency of so many people like us all over the world who lack so much. And we will be truly convinced and will affirm that the time for apathy is over. 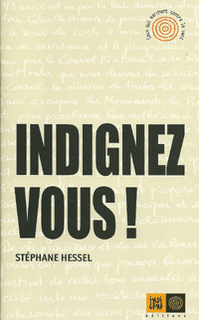 Stéphane Hessel has recently published a booklet –an excellent idea for disseminating high-impact ideas- inviting us to refuse to resign ourselves to the present situation and, to get angry! As you can see, the collection is dedicated to those who are “walking against the wind", a name applied to the Omaha tribe of Native Americans, related to the Sioux. At 93, in his “final stage” and returning to his roots, Stéphane Hessel demands from us a public commitment to resistance, to defending human dignity at all times, to refusing to remain passive unmoved witnesses. If there ever was a person with sufficient moral authority to offer this advice and to warrant such attention, it is Stéphane Hessel, the only surviving co-author of the Universal Declaration of Human Rights, so lucid, and who given the urgency of his age and the present circumstances calls on us to participate in a “peaceful insurrection". Was perhaps he who in the second paragraph of the Universal Declaration wrote that human beings may find themselves “compelled to rebellion”? "Indifference”, he notes, “is the worst of all possible attitudes". We must react. Freed at the last minute from the Buchenwald and Dora concentration camps, Hessel offers us his supreme lesson in impartiality when he confesses that today he is “principally outraged by the situation in Palestine, Gaza, the West Bank... where the Israeli army’s acts are totally reprehensible: 1,400 deaths on the Palestinian side vs. 50 wounded Israelis... It’s inadmissible for the Jews to perpetrate war crimes", he concludes. And he adds: "I am convinced that the future must bring non-violence and conciliation among different cultures ". “To those who will build the 21st century I say with great affection: create and resist. Resisting is creating ". When I finished reading this timely message, I was reminded of the wisdom of my mother who recommended that I rest only when necessary and sleep very little, in order to take advantage of the mystery of life, and when toward the end of the 1940s (I was 16) she advised me: "If you want to be happy, never accept what you consider unacceptable ". "Let’s not be so patient", said José Saramago. Thank you, Stéphane Hessel: I hope you live to see the onset of the peaceful resistance you demand. Although, wherever you may be, you will feel the breezes of our gratitude. The time to say “Enough!” has arrived. To serenely and firmly proclaim that humanity cannot continue to suffer the interminable trauma of a system that has given rise to the present multiple serious crises (social, financial, food, environmental, political, ethical...). The time has come for a great citizen mobilization against the dominating powers (economic, energy, military, media), so that a great transition may immediately commence from an economy of speculation and war (4,000 million dollars invested daily in weapons and military spending while –I will never tire of repeating- over 70,000 people die of hunger) to an economy of global sustainable development, which will rapidly reduce the enormous social injustice and inequity and the progressive (and possibly irreversible) damage to the environment. The time has come to prevent and to sanction attacks that, through renowned rating agencies, the “market” is making on governments, those impoverished “rescuers” who must now slash their own budgets or risk financial collapse. Those who supported “less government and more market”, assuring us that the markets were “self-regulating” and that tax havens would disappear, must now retract those statements in public and correct the grave damage done. The time has come for passive subjects to become full citizens; for the silent to participate; for spectators to become actors... now that modern communications technologies make distance participation possible. And above all, through cyberspace the time has come to stretch our listless bodies; to awaken to a new day in which the reins of our common destiny are no longer in the same secular hands. The academic, scientific, artistic, that is, the intellectual community must lead the process that will enable us in less than a decade to make the “new beginning” proclaimed in the Earth Charter. The time to say “Enough”” has come, the time to rise up, and as José Ángel Valente expressed in his poem, the time to refuse to give up.